Boulder County Seed Collection I - Family Friendly - Minimum Age: 8 with Adult. 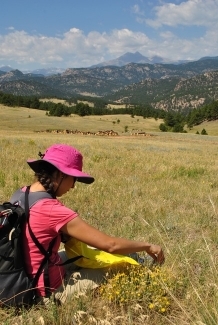 Volunteers will help ensure the success of future public land restoration projects by hand-collecting seeds from a variety of native species, including grasses, wildflowers, and shrubs in the foothills of Boulder,CO. Local botanists will be working on site and will provide identification of wildflowers and other native plants during the project. Why collect native seeds? Using native seeds in re-vegetation efforts is essential to restoring native plant diversity. Some native species are not available commercially, are too expensive, or the available seeds are not ecologically appropriate. Our collected seeds will be used in local habitat restoration projects, or may be grown out in an agricultural setting to increase them 100 or 1000 fold, vastly increasing the amount of locally-adapted seed that is available for local restoration projects. The location of seed collections can only be determined 2-3 days prior to each event, given the varying growth rates of the many species we collect. This project is in Boulder County. Once you register, you'll receive info by e-mail 2-3 days prior about the location, directions and species you'll be collecting. Location TBD, but will be e-mailed 2-3 days prior to the event. Questions: For Questions about this event, please contact Erica Christensen-Cooper with Wildlands Restoration Volunteers at 3035431411 or erica@wlrv.org.